This question comes up time and time again. 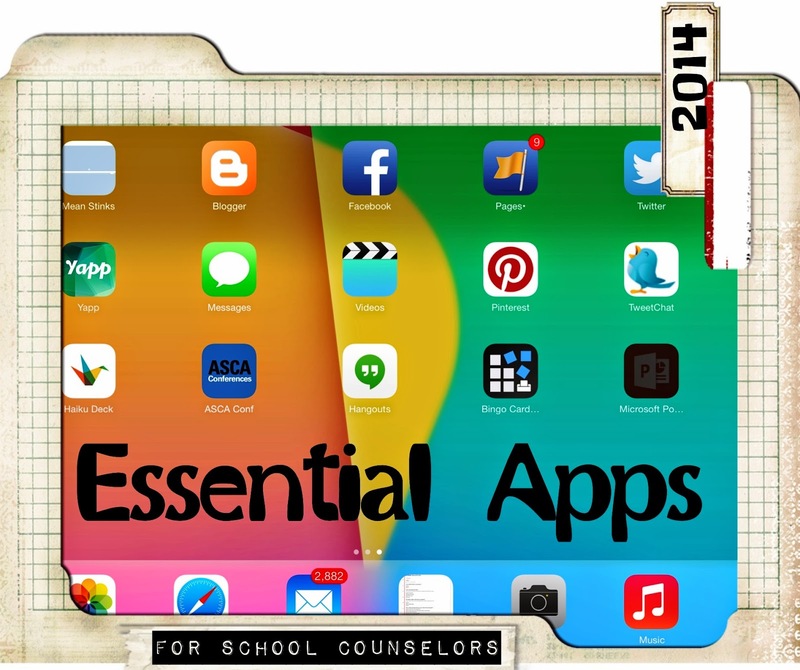 Counselors have emailed me, posted on my Facebook page, and asked in each one the Facebook groups, asking about what are the "must have" iPad apps. Althought there are a lot more out there, here are my favorites and ones I have installed on my iPad right now. There are several I do not have but hope to have soon. I am excited that Microsoft Office is now available for iPad. (Currently I do not have enough free space to load the programs, but once I clear off the movies and pictures that are taking up so much space, I will be installing the whole MS suite). There are also apps for the National Counselor Exam review, Remind 101, numerous games, relaxation apps, dictionaries, google +, reading, etc. While I have some of them, I do not use them extensively, so therefore they did not make it on my Essential List. So what are your favorite apps? Let me know the top 5 you can't live without. Share your ideas below in a comment or join the discussion on Facebook or Twitter. I tried to find the "What if..." app, but it took me to one that was for adults (risque' questions). I wasn't able to find one to use with kids....do you know who the app developer/creator is? That might help in my search. Thanks. When you find a really good mobile app, many times it completely changes the utility of your device. Most of these apps are now integral part of everyone’s routine, irrespective of their work and industry. Things change lot from past, now schools are becoming paperless, how? Schools admin and teachers are using the school management apps.